Nutritional support with natural plant estrogens for women's special needs. 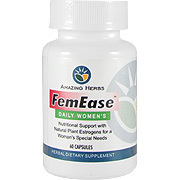 FEM EASE is an all natural dietary supplement featuring a unique blend several natural herbs and plant estrogens such as Black Cohosh, Wild Yam, Dong Quai, and Vitex (Chaste Berry), known for their enhancing and therapeutic properties. Together they provide an excellent source of nutrition to support a woman through and after her menopausal years. 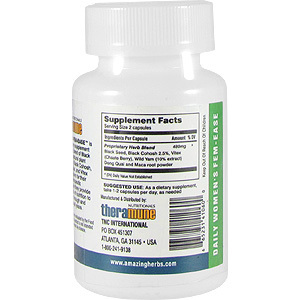 As dietary supplement, take 1-2 capsules per day, as needed or directed by a physician. FemEase is an all natural dietary supplement featuring a unique blend of Black Seed with several natural herbs and plant estrogens such as Black Cohosh, Wild Yam, Dong Quai, and Vitex (Chaste Berry), known for their enhancing and therapeutic properties. Together they provide an excellent source of nutrition to support a woman through and after her menopausal years. Daily Women's FemEase is shipped in a discrete, unmarked package. Orders are processed immediately and usually take about 3 to 5 working days to be received. We do ask that you try it for 2 to 3 weeks to feel the full effects. Any information received is used only for order processing and shipping purposes. Your information, such as e-mail address, will never be disclosed to a third party.